In the midst of all my other projects, I simply had to work on a piece that recalls our trip to Antarctica. And so, my latest art quilts, Antarctic Resident, was born. This was a good deal of fun for me. The most challenging part, no doubt, was finding a way to portray the Antarctic waters. I wound up bleaching a piece of hand-dyed fabric that I had gotten a few years ago from Lisa Walton at Dyed and Gone to Heaven and then searching and searching for a blue for the one large iceberg. The most satisfying part of this piece's creation was undoubtedly my Adelie penguin. I had been collecting different sorts of black fabric prints for a year, knowing that I was likely to want to make a penguin after our trip. I wound up using some plain black for this version and using thread to create texture. I suspect I will use some of those other fabrics in future pieces. Judy, I love this! It reminds me of a seagulls in Maine quilt I did - a group of 3 seagulls on a portion of rocks....sort of the same "picture" concept as yours. One of my favorites and my church choir bought it for our director as a gift!!! A win-win for both of us!! 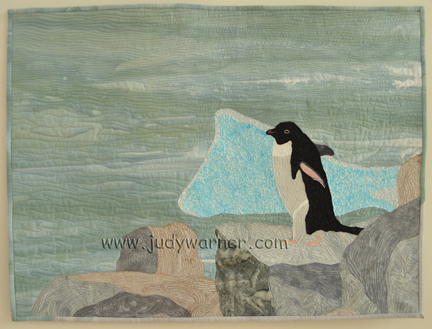 Oh Judy, "Adelie" is so cute! (I know that's the type of penguin, not her name, but I couldn't resist!) And what you've done with the ice and water is just right. Looking forward to more!